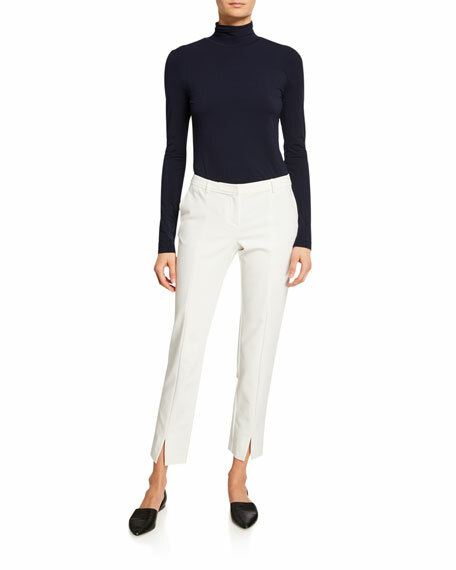 Eileen Fisher ultrafine merino knit top. Cowl neckline. Long, dropped sleeves. Asymmetric high-low hem; side slit. Relaxed fit. Merino wool. 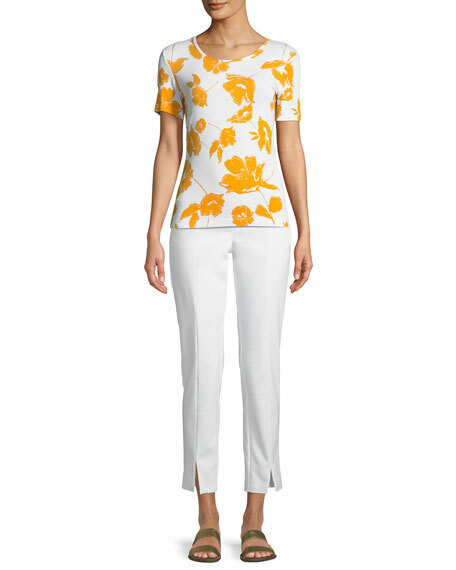 Eileen Fisher ultrafine merino knit top. Cowl neckline. Long, dropped sleeves. Asymmetric high-low hem; side slit. Relaxed fit. Merino wool. Hand wash. Imported. Model's measurements: Height 5'10"/177cm, bust 33"/84cm, waist 25.6"/65.2cm, hips 35.8"/91cm, dress size US 2-4/FR 34-36. Elegant silk jersey cami, knit for natural stretch, offers washable, packable luxury. Approx. 19.5"L down center back. Scoop neckline and back. Sleeveless; thin shoulder straps. Longer, slim fit. Hem hits below hip. Silk; hand wash. Imported. Necklace not included. 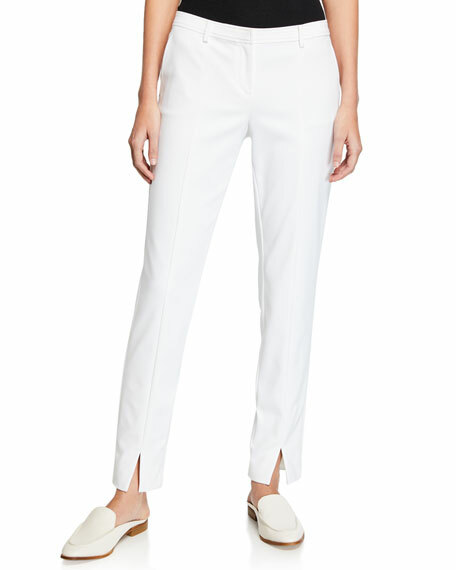 Joan Vass soft knit pants. Approx. measurements: 15" rise; 31" inseam; 43" outseam; 15" leg opening. Natural rise. Wide legs fall straight from hip. Lantern shape. Banded cuffs. Pull-on style. Silk/cashmere/polyester/Lycra?? spandex; dry clean. Imported. 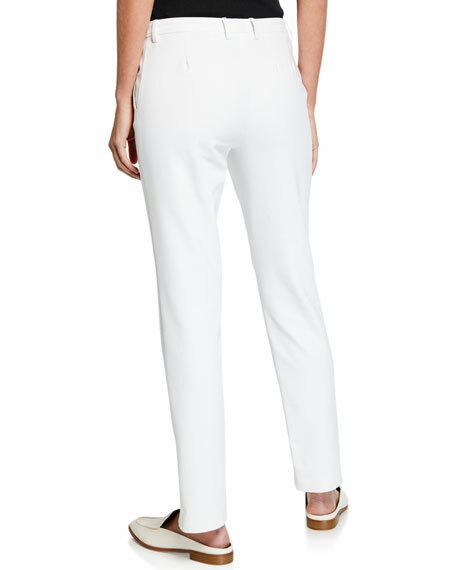 Model's measurements: Height 5'11"/180cm, bust 34"/86cm, waist 24"/61cm, hips 34"/86cm, dress size US 2. 9GG, 2-ply poncho top. Cowl neckline. Short dolman sleeves. Boxy, relaxed fit. Fringed hem. Pullover style. Cashmere. Dry clean. Imported. 9GG, 2-ply poncho top. Cowl neckline. Short dolman sleeves. Boxy, relaxed fit. Fringed hem. Pullover style. Cashmere. Dry clean. Imported. Model's measurements: Height 5'10"/177cm, bust 33"/84cm, waist 25.6"/65.2cm, hips 35.8"/91cm, dress size US 2-4/FR 34-36.